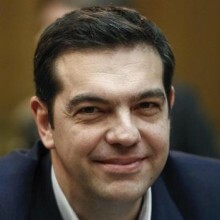 Alexis Tsipras was born in 1974. He entered into a civil partnership with Betty Baziana, and together, they have two sons. He studied Civil Engineering at the National Technical University of Athens, from which he later received a graduate degree in Urban and Regional Planning. He was Secretary of the youth wing of the “Coalition of the Left — Movements and Ecology”, from 1999 to 2003. In 2006, he was elected Councilman of Athens. In 2008, he was elected party President during the 5th Congress of the “Coalition of the Left”, and then re-elected during the 6th Congress in June 2010. He has served as President of SYRIZA from the founding party congress in July 2013. Since December 2012, he has served as Vice President of the “European Left” party (EL). In December 2013, he was nominated EL’s candidate for President of the European Commission. He was elected MP and head of the Parliamentary Group of SYRIZA during the national elections of 2009. He was re-elected MP during the national elections in May and July 2012, and has since served as Leader of the Opposition. On January 26, 2015, he was sworn in as Prime Minister of Greece.